Pinot Grigio is delicious when served chilled. This white wine varietal makes a terrific sipper for the warmer weather of summer. However, serving it at the proper temperature is essential to get the maximum enjoyment out of all the flavors in the wine. Every wine has an ideal serving temperature, and Pinot Grigio is no exception. 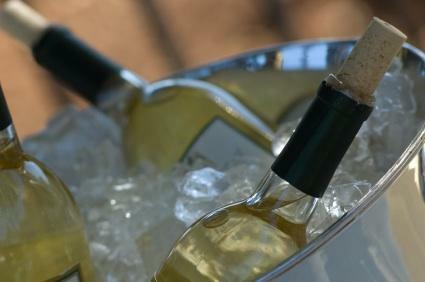 Pinot Grigio/Gris is definitely a wine whose flavors are enhanced when it is served chilled. The ideal temperature for all types of Pinot Grigio (including frizzante Pinot Grigio) is 48 degrees Fahrenheit. Serving the wine too cold or two warm will mask the flavors of the wine. To chill the wine to this temperature, place it in the refrigerator for about two to three hours before serving and then set it at room temperature for about 10 minutes prior to serving. You can also chill the bottle immediately prior to serving in a rapid wine chiller for ten minutes, or place it in the freezer for about 20 minutes. If you'd like to be precise on serving temperature, there are a number of wine temperature thermometers that you can buy to measure the temperatures of your wines prior to serving them. Should Cabernet Sauvignon Be Chilled? Keep the bottle in an ice bucket or in the refrigerator between pourings. Hold the wine glass by the stem rather than by the bowl. This will keep your hand from warming the wine to above the desirable temperature. Serving temperature is only half of the equation. Because wines are delicate and can break down or go "bad" under improper storage conditions, how you store Pinot Grigio can also have an effect on the flavors and aromas of the wine. While light whites like Pinot Grigio aren't meant to be stored for years like more structured reds, you can store Pinot Grigio for several months. To properly store the wine, place it in a temperature-controlled environment where the temperature doesn't have wide daily swings and is always under 70 degrees. Don't store the wine in a refrigerator which is too cold for long term storage. Always store the wine on its side away from direct light and vibration. Many people feel that serving temperature isn't all that important for wines. The truth is that when wine is served at the improper temperature, many of the delicate flavors and aromas that make wines unique are lost. Serving wine at proper temperatures - usually slightly below room temperature for reds and chilled for whites - can truly enhance your wine drinking experience by allowing the full flavor and aroma profiles of the wine to come through. Properly chilling Pinot Grigio before you serve it can help you truly enjoy the flavors, aromas and body of this delicious light wine.